UWCFX, United World Capital Ltd, an FSA regulated broker founded in 2008, offers a forex bonus of 30% over the initial deposit and a 10% forex reload bonus on every subsequent deposit. 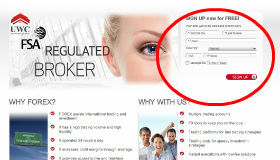 It has in the past also offered a forex no deposit bonus (called 'welcome bonus') but this is currently inactive. The forex deposit bonus that UWCFX offers has no maximum, but there are some tricky rules that you should know about before going for the bonus. See below, in 'Bonus Details'. You have to deposit within 24 hours (excluding weekends and public holidays) of your account registratrion. If you have not traded at UWCFX during a period of 90 days, the bonus will be nullified. If you withdraw while the bonus has not yet been cleared, the withdrawal will be deducted from your initial deposit, and UWCFX will calculate what the bonus would have been for the remaining sum. That amount is then deducted from the bonus that was given, so part of the bonus (or all of it if you withdraw 100% of your initial deposit) will be nullified. Our advice is therefore that if you want to use this bonus, it's better not to withdraw before having cleared it. If there are no open trades and the account balance is less than the bonus that was given and there were no trades closed during the past seven calendar days, the bonus will be nullified. You have the right to refuse a bonus - for instance the reload bonus, if you want to clear the 30% bonus first. You do this by unchecking the box "Obtain Trading Credit (Bonus)" when filling out the Funds Deposit Form or Client Registration Form. You will clear $2,5 of the bonus for each Standard Lot traded. The minimum amount of bonus to be cleared before you can claim it, is $10. You will have to claim the bonus that is cleared by notifying UWCFX. UWCFX supports Metatrader, so for those traders used to Metatrader, that's good news. It supports both Metatrader 4 and Metatrader 5, Metatrader MultiTerminal (if you want to run multiple accounts in Metatrader at the same time) as well as Mobile Metatrader. There is also good news for Apple users though (for whom Metatrader is not easily usable) because UWCFX also offers a webtrader and a mobile trader for iPhone, Android and Blackberry. In short, there is no operation system unable to trade through United World Capital, and that is rare. Also rare is that UWCFX is very well regulated. It's regulated by all the important financial authorities in Europe, including the Financial Services Authority in the United Kingdom, the Bundesanstalt fur Finanzdienstleistungsaufsicht in Germany and the Autoriteit Financiele Markten in the Netherlands. The spread is not fantastic but it's not bad either, simply average, compared to other brokers. Same goes for the product range. Besides forex, you can trade in gold and silver and a limited amount of stocks. Mind that you need at least a Mini account (min deposit $100) to be able to trade in commodities at UWCFX though. All in all this is a pretty good broker, except when it comes to the terms of their forex bonus. It's hard to clear, compared with release requirements of many other brokers, and quite a few situations can arise when UWCFX can nullify the forex bonus. However, if you're looking for a good, solid broker, well regulated and with a trading platform that is accessible from eveyr possible device, you could do much worse than UWCFX. 4. 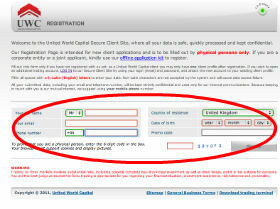 Make first deposit within 24 hours of registration. The 30% 1st deposit bonus will be immediately available for trading.